In the first quarter of 2012, Walmart offered two exclusive Battle Packs including the Mos Espa Arena and the Royal Starship Droids. 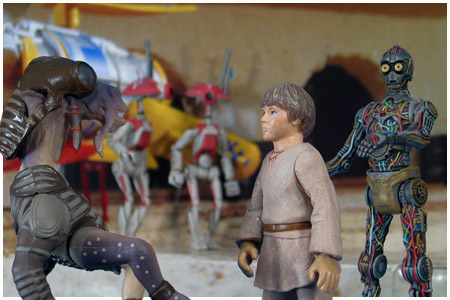 Both sets offered repainted figures from Star Wars Episode I: The Phantom Menace. The Mos Espa Arena set featured repainted repacks of the 1999 Episode I C-3PO, the 2000 Power Of The Force Boonta Eve Challenge Sebulba, the 2000 Power Of The Force Mechanic Anakin Skywalker, and the 1999 Episode I pack in Pit Droids along with a six-sided die, five Galactic Battle Game cards, and five randomly packed Black Display Stands. All five figures in this Battle Pack are repaints without additional retooling. This Battle Pack features two exclusive Podracer flags not available anywhere else. The Podracer helmet included with the Anakin figure was also packed in with the Movie Heroes Anakin Skywalker figure.